Greetings from Schmidt Motors; the home for the top automotive service and support in the Ogallala area. From tackling simple items such as oil changes to helping you handle accident repairs and other major challenges, it is plain to see our crew of committed, authorized technicians are ready to handle anything that comes their way. For those individuals in Ogallala who drive a vehicle from a different automaker, we would be more than happy to help you during this sometimes scary process. Our automotive service professionals have years of experience managing repairs and maintenance for a wide selection of other automakers, so you can take comfort in the fact that your automobile from another manufacturer is in good hands when the time comes to drop it off for a repair. Before considering any other choice, go ahead and join us and dig a little deeper into why so many of our friends in Ogallala will not take their vehicles in for service and repairs anywhere else. After running through this approach, chances are you will be ready to set things in motion regarding your service needs and plan out a trip to Schmidt Motors in the near future. 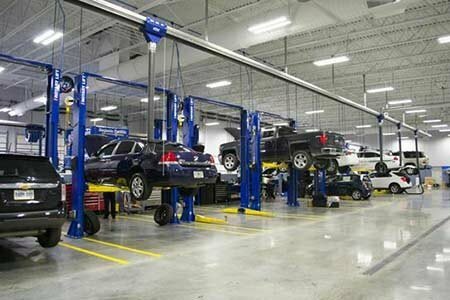 Placing a Focus on Your Safety and Excellent Service and Repair Techniques — The Schmidt Motors organization takes your well-being seriously, so you can drive with confidence knowing we will do whatever is necessary to get your vehicle back in working order in as quick a manner as possible. Keeping a Close Eye Out for Your Budget — Not interested in paying an arm and a leg for your approaching automobile service? Then come to Schmidt Motors and you will soon learn just how serious we are when it comes to keeping you on point with your budget. Access to the Finest Replacement Parts — Servicing a Chrysler, Dodge, Jeep, Ram, Chevrolet, Buick, or GMC vehicle? Then you will be pleased to find out that we have access to all of the industry-leading original equipment manufacturer (OEM) parts necessary to replace the damaged or faulty item in question. As you can see, Schmidt Motors is the best choice in the Ogallala NE location for people who want to make the most of the optimal blend of excellent service, superior support, and affordable repair rates. Going a bit further, Schmidt Motors is not just the dealership that offers up the best blend of dependability and value, but also home to the most qualified collection of authorized mechanics. While you might be questioning the notion of always needing to turn to the finest crew of Chrysler, Dodge, Jeep, Ram, Chevrolet, Buick, and GMC service specialists here in Ogallala, the reality of the situation is the years of hard work and training undertaken by these men and women effortlessly supersedes anything that you will find at a local or regional repair and service garage. Yes, these small-time organizations might talk a big game or use clever sales practices at times. However, it is still vital to understand that only accredited mechanics have spent the countless hours necessary to achieve this privileged designation from Chrysler, Dodge, Jeep, Ram, Chevrolet, Buick, and GMC. Additionally, obtaining this status also comes with the power to engage directly with these brands and stay abreast with all of the most recent news and insight into their vehicles and the best service and support procedures. When it comes to keeping your car in great condition, are you sincerely ready to settle for anything but the top-notch service and heightened requirements that come with the hard work performed by an accredited technician? Oil Changes — Neglecting to routinely replace your oil is an easy way to wear away the vital parts of your engine via a shortage of lubrication. Tire Rotations — Wearing, splitting, and bald spots, as well as a greater risk of accidents, are all symptoms of tires that have not been rotated on a regular basis. Timing Belt Changes — A neglected timing belt is similar to an impending disaster in that it can inflict extreme damage to a car's engine if it reaches the point of major degradation and fails during your daily routine. Brake Inspections — While brakes might come across as boring, sectioning off a couple of minutes to inspect these critical components on a consistent basis helps ensure they are in working order when you need to slow things down. These are just a small amount of examples that speak to why overlooking scheduled upkeep is never a smart decision. The health of your vehicle is on the line, so feel free to reach out to Schmidt Motors when the time comes to deal with these often uncomplicated services. Now that you understand how necessary handling your recommended maintenance with a dependable institution like Schmidt Motors is to the life expectancy of your vehicle, it is the perfect time to help you map out an ideal service itinerary. To get off on the right foot with this endeavor, make it a point to give our team of dedicated and factory-trained automotive professionals a phone call at (308) 535-1191 (Chrysler Dodge Jeep Ram) or (877) 260-1502 (Chevy Buick GMC) today. By deciding to manage your service needs with the assistance of the crew here at Schmidt Motors, you will be taking a great step toward extending the useful life of this important asset. Considering how necessary keeping your car in peak form is to your everyday routine, as well as your time spent traveling outside of Ogallala, it makes all the sense in the world to get with the Schmidt Motors team right away and get back in order with your routine maintenance itinerary as soon as possible.